"circle V": Single or double circles? Hi, my question is simple, why do some eyepieces have a single "circle V" marking and some have a double circle around the V? I did search google and this forum+archives and found some mentionings on this subject in various threads, but never a really definite answer. E.g. I somewhere found a thread that stated that there are quality differences (double circle V worse quality). Well, I have got two 18 mm 0.96" orthos, one with single and one with double circle V, and I can't detect any ever so slight difference in performance and appearance between them. Only the engravings are different (see picture). Is there any more knowledge about this? Hi John, yes both eyepieces were sold to me as Vixen eyepieces. My best guess after going through many Vixen eyepieces and telescope packages is that the one circle V was before the double. I believe the change occurred around 1985. I had always found the one circle V's to be superior to the doubles. But, recently I acquired some doubles from 1986 that look like yours and performed well. On the other hand, I have had several double circle V's, especially 5mm OR, that were dogs and no where close in quality to their single circle V cousins. Hi Steve, thanks for your input on this. I have another circle V Ortho, 9 mm. This has a *single* circle but is made almost entirely from plastic in contrast to the two 18 mm Orthos shown above. When looking through there is much internal reflection, again a big contrast to the two 18's. My first thought was that the plastic 9 mm is some later "budget" series in contrast to what previously was a very fine craftsmanship production. But as it has the single circle, and thus can't be a later date of manufacture, this can't really be the case? Photo shows all my current Vixen eyepieces. The plastic 9 mm, then the two 18 Orthos and a (terrific) 20 mm Kellner. The H-18 mm has no circle-anything marking on it but was definitely sold new by Vixen as I got this back in 1988 with my then-new Vixen Cygnus 60/800 scope. It's however a VERY basic eyepiece and another steep step down in quality from the 9 mm Ortho. In contrast, as already said, my 18 Orthos and 20 Kellner are all really great quality in any respect, no matter if single or double circle. I used to own several Circle-V orthoscopics and all of them were excellent performers - tack sharp out to the edge of the field with a nice cool bias to the view. Also, early Celestron orthoscopics were manufactured by Vixen and these are identifiable by a small Circle-V stamp on the chrome portion of the barrel. The Circle-T and Circle-Dash Celestron orthoscopics are noticeably inferior to the Circle V incarnations. Maybe what we need is another Enigma Machine. Is there any single source/thread/sticky/article - on this or any other forum - that attempts to decode ALL the various circle letters - and rank them according to general desirability? Inquiring people wanna know! Decode? How about just a list of the symbols? I can see where my thought on the single vs double V is wrong. I would think someone in Japan has this all decoded already. Good idea. This has been discussed before, but it's buried in the archive somewhere. AFAIK, there is no definitive information source about these maker's marks. 1) If a manufacturer's mark is on a sticky label and not engraved, then it's generally of lower quality than the eyepieces with engraved marks. 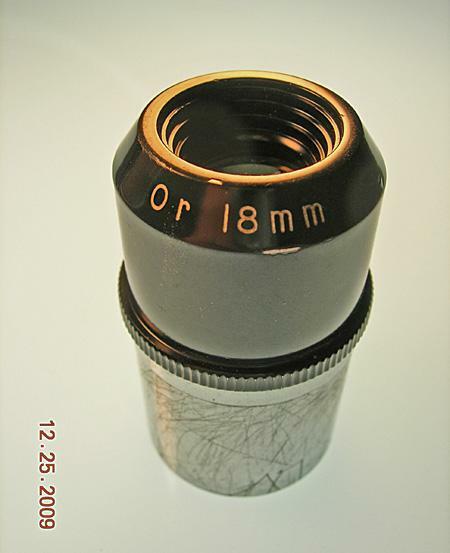 Having an engraved mark is no guarantee of superior performance, but it means the eyepiece predates the types with adhesive labels. Generally, the older glass is better, so engraved is better. 2) Opinions can vary on what companies/manufacturers that the marks signify. 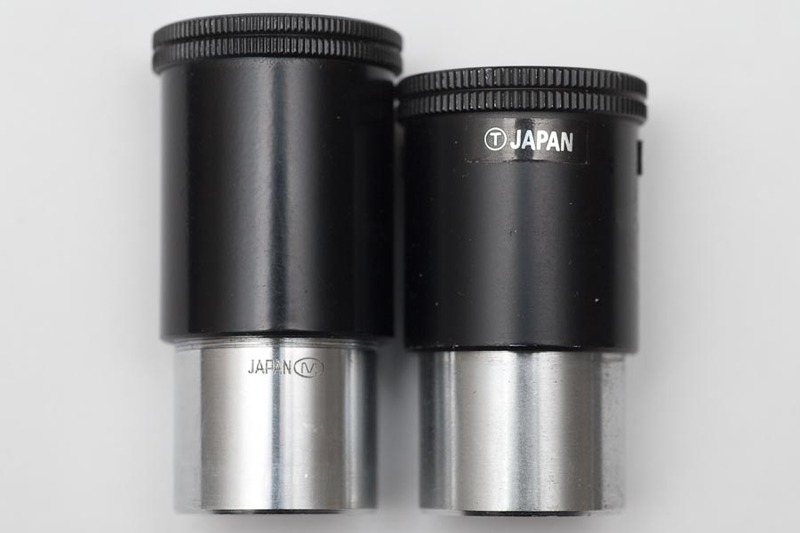 There were many many optical firms in Japan in the post-war years that were making telescope and microscope eyepieces. I would hazard to say that there were hundreds of manufacturers if you count the obscure and small ones. Many of these companies used maker's marks, many did not. Some of the marks look similar to each other and can be confusing. 3) Circle T signifies the Towa optical company. 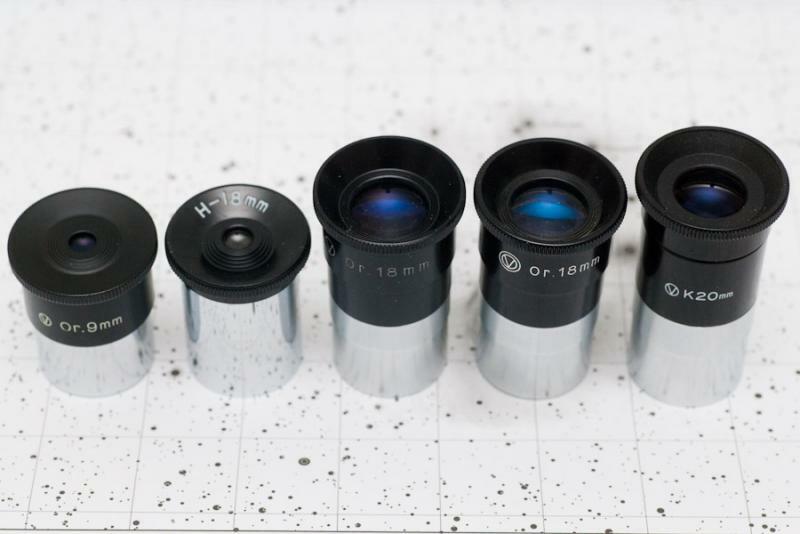 These are generally good "work horse" eyepieces with their quality being better than the current crop of eyepieces that come as an accessory with most new scopes. But, the quality can vary widely. Some Circle-T eyepieces are better than others. Also, the majority of Circle-T telescopes are of good or better quality. 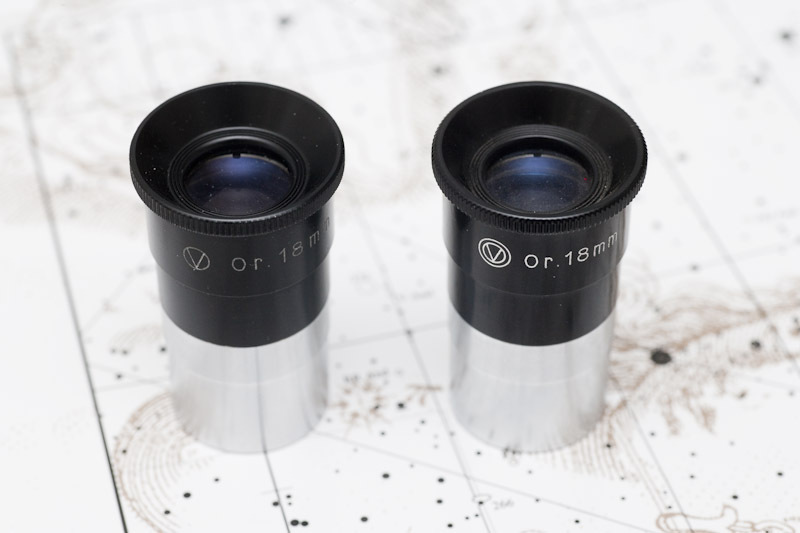 As with the eyepieces, the older Circle T scopes are better than the newer ones. 4) Circle V is Vixen optics. The vast majority of Circle-V eyepieces are superior quality. Circle-V orthoscopics are especially desirable. I haven't seen a bad Circle-V eyepiece yet. Most Circle V scopes are outstanding as well. Same goes for accessories like barlows and camera adapters. If it has a Circle V on it, it's a good piece of equipment. 5) Circle K - I forget who this company is at the moment (Kenko? ), but I have had mixed results with them. The majority of eyepieces I have tried with the Circle-K mark were inferior to my eye (not nearly as good as Circle V or Circle T), but that is just my opinion. I have also heard good stories about them, so it might be a matter of luck or the scope being used. I have no experience with Circle K scopes that I can recall. 6) Circle Dash - I have no idea who this company is, but they are Japanese. 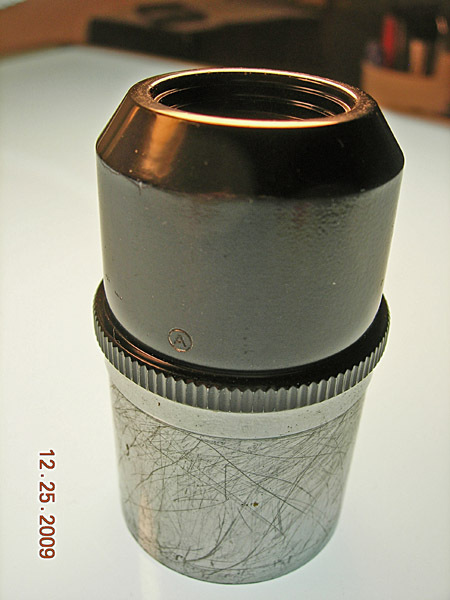 Some Celestron eyepieces in the early 1980's carried a "Circle Dash" mark. I found these to be similar in quality to Circle T, but not nearly as good as Circle V.
I'm sure there are many others, but those are the common ones I can recall at the moment. Circle M is one that I'm curious about. Anyone know the origin shop in Japan? Can you post a picture of the telescope and the Circle M logo? I've had an 18mm Ortho volcano top (1.25") in my junk box for decades. It has a Circle A on the barrel. Could that stand for Asahi? I've had this eyepiece a very long time and don't know where I got it. It has a loose lenses, which just may be a loose retaining ring or a missing spacer. I'll find out tomorrow. Here are two pictures of it. Maybe one of you big kahunas can shed some light on it. It's an eyepiece, not a scope. Specifically, a Celestron 25mm K. (Circle M). Has the yellow "passed" circular label from the Japan Telescope Inspection Institute affixed to the housing. Nice piece of glass. APL-Apollo Business & Industry-Bought by Koyu, then Vixen. The attached file has pictures of these. In a prior thread, Hiroki confirmed yours is Astro Optical. You just answered my question. Circle A stands for Astro Optical. Cool. Same Japanese company that produced the fine refractors? Are their eyepieces as well regarded? 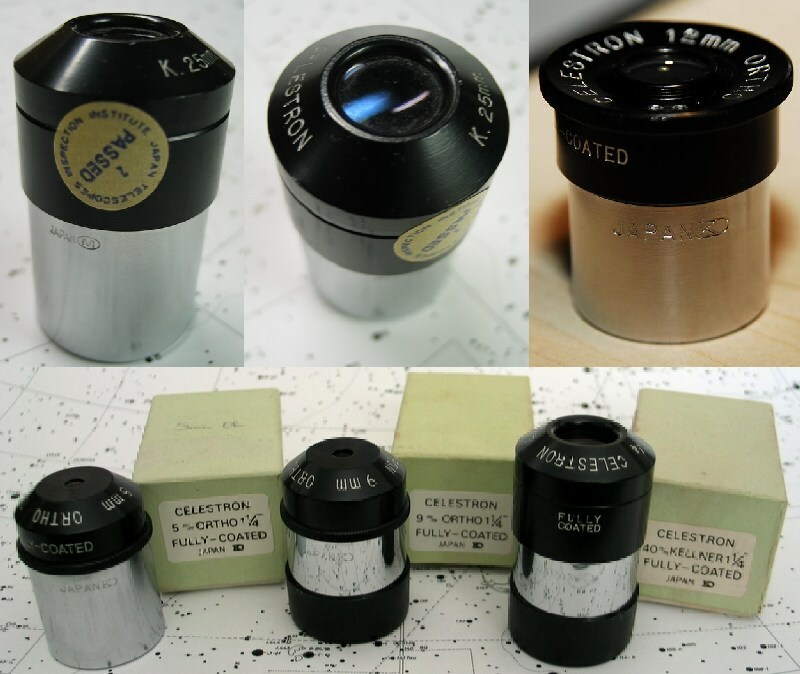 From this old post by Sheldon, I got the impression that a lot of the old eyepieces were actually made by Carton and then marked with different logos. This picture posted by Galakuma, pretty well convinced me that my circle K Tasco was made by Kenko. Photo of my Circle M.
Thanks for the pic Charles. I have never seen that mark before. Someone mentioned Diamond-Z earlier. I used several Diamond-Z eyepieces and a Diamond-Z scope. The scope was a Tasco 99VR short tube achro (successor to the superior Vixen-made 9VR). The scope was good quality, but the eyepieces were subpar. Following with interest as I asked the question about the Vixen Circle-V and Double Circle-V on CN and several forums some time ago. More than once. Never have gotten a good answer. 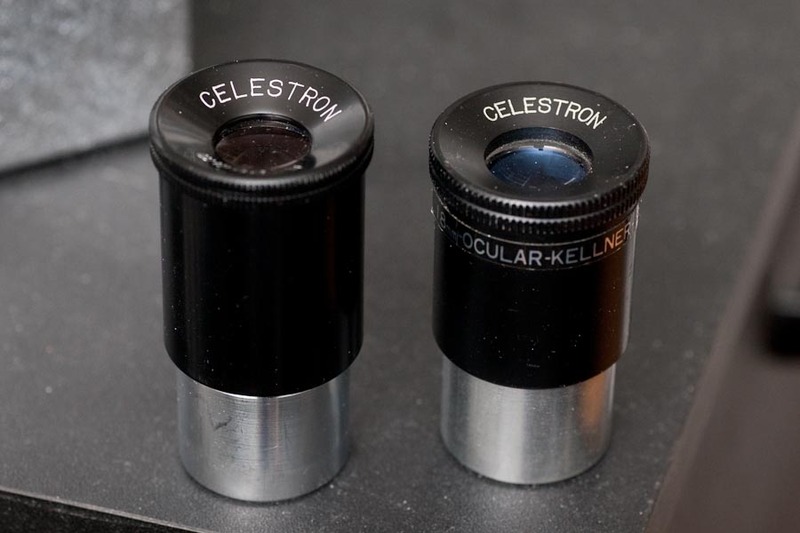 BTW, IIRC the Circle-M eyepieces were imported by Celestron as far as we can tell in the late 60's. They were replaced by the "KD" marked Celestron eyepieces about 1970 in two versions; a 'Flat Top' and a 'Volcano Top'. These were then replaced by the Celestron Circle-V eyepieces about 1980. Blake Andrews is the expert on these. I wouldn't be willing to bet a large amount of money on the fact that the Double Circle-V eyepieces of this style were all manufactured after the single Cirlce-V eyepieces of this style. 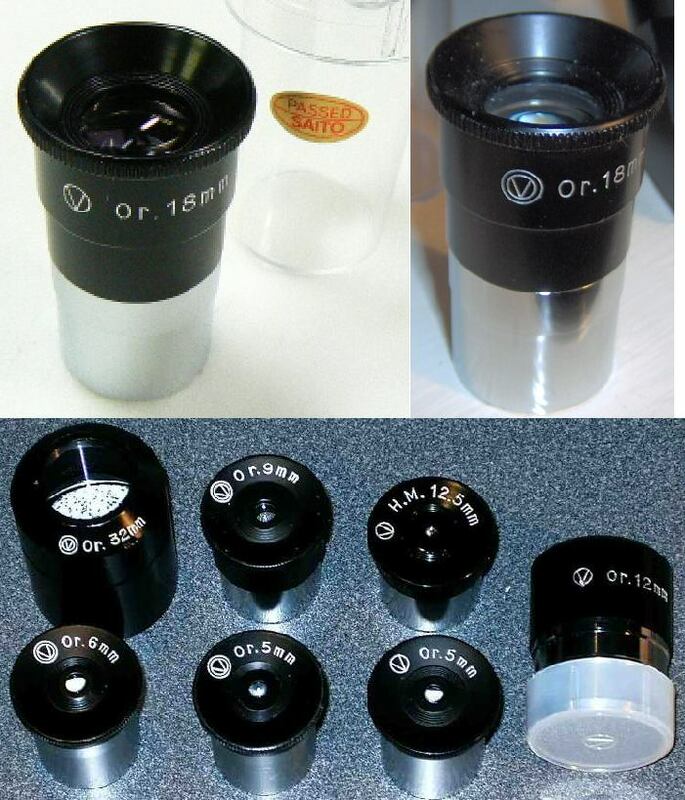 I've spent many hours comparing Vixen eyepieces of all styles and types. With regard to the style you've pictured, I've directly compared at least 5 different focal lengths (Single versus Double Circle-V). I have also tested 'Plastic' Single Circle-V and Double Circle-V eyepiece in this style. About all I can say for certain is the ones made of the same construction have always been comparable. The plastic eyepieces have consistantly been poorer quality than the others. Sorry I don't have a picture handy of all the focal lengths of this type Vixen Circle-V, but this picture gives you an idea of some of the 'better' made eyepieces I've compared. I've generally gotten rid of any of the 'plastic' type you've referred to. As indicated, I do not have an answer about the Single Circle-V versus the Double Circle-V. At this point, if I had to venture a guess, the most logical explaination I've heard is they are different "Factories" or "Assembly Lines". Here's a picture of my Circle M Celestron Kellner 25 mm as well als a Circle T Celestron Kellner 18 mm. The 18 has stickers that could eventually get lost. 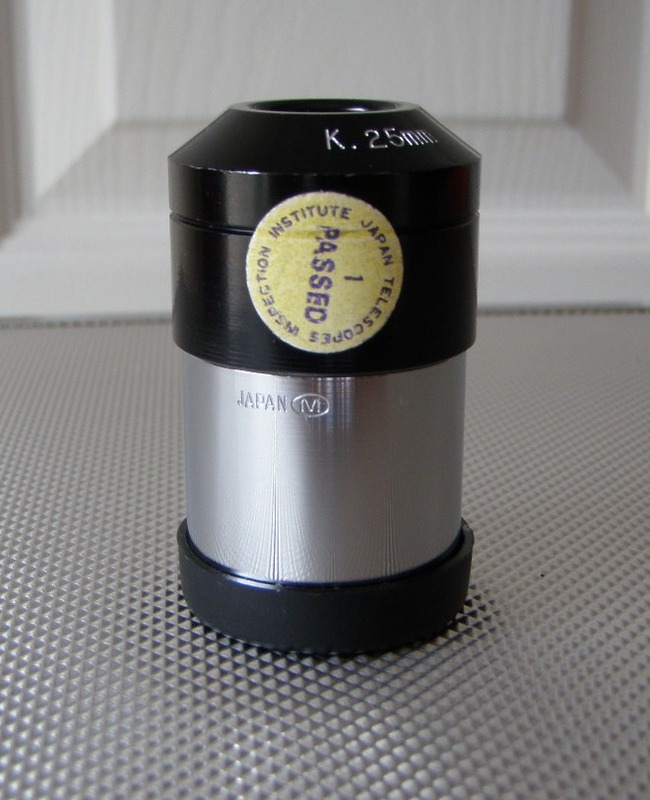 Lots of Circle T eyepieces are still available currently (see here) even some 0.96". I assume that today they all have Circle T stickers on them instead of engravings, according to the images in the link above. another pic, the 18 is the Circle T and the 25 is Circle M.
These two look very similar, the black parts of the eyepiece are shaped like a cylinder and a bit wider than the chromed 0.96" barrel. Also, they both have a very similar design on the top of the eyepiece. But the 0.96" Circle V's look different, the black part normally has a "step" in it, resulting in the top of the black part being a bit wider than the bottom. Due to this slight differences in shape, 0.96" Circle M / T do not fit the plastic containers that Circle V's were delivered in. Does anyone know what manufacturer Circle M is?